Health Promotion at Health and Counselling Services educates, promotes and advocates for optimal student health and academic success by working in collaboration with students, faculty, services and community agencies, while providing opportunities for student engagement in individual and community health and wellness issues. Join our Health Promotion Leaders and Peer Educators on Facebook, Twitter and Instagram. Or reach our office at (613) 520-2600 ext. 6544. Our goal is to empower students during various stages of change for healthy living and academic success by offering resources, services, programs and activities that focus on student wellness and overall subjective health. The team is made up of a Health Promotion Coordinator, 4 Health Promotion Teams (including 4 Team Leaders and their group of volunteer Peer Educators) and the Leave the Pack Behind Team (including 2 Social Change Specialists). 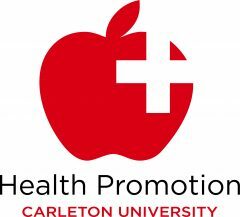 Each team takes on a different health topic ready to provide information and resources for all Carleton University students. Interested in volunteering? Please email the Health Promotion Coordinator: nicole.dibiagio@carleton.ca.